Polyvinylidene fluoride: a suitable mesh material for laparoscopic incisional and parastomal hernia repair! Today, the laparoscopic approach is a standard procedure for the repair of incisional hernias. However, the direct contact of visceral organs with mesh material is a major issue. This prospective observational study presents the data of 344 patients treated for incisional and parastomal hernias with a new mesh made of polyvinylidene fluoride (PVDF; Dynamesh IPOM®) between May 2004 and January 2008 with a minimum follow-up of 6 months. The median follow-up of 297 patients after incisional hernias totaled 24 months and 20 months for 47 patients with parastomal hernias. Incisional hernias were repaired using an IPOM technique. For parastomal hernias, a recently described sandwich technique was used with two meshes implanted in an intraperitoneal onlay position. 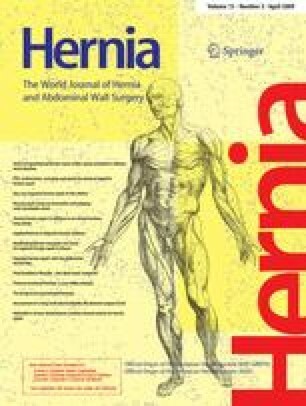 The recurrence rate for incisional hernias was 2/297 = 0.6% and 1/47 = 2% for parastomal hernias. Three patients developed a secondary infection after surgical revision or puncture of a seroma. One patient had a bowel fistula through the mesh, with an abscess in the hernia sac. In all cases, the infection healed and the mesh could be preserved. No long-term mesh-related complications have been observed. The laparoscopic repair of incisional and parastomal hernias with meshes made of PVDF (Dynamesh IPOM®) revealed low recurrence and, overall, low complication rates. Especially in cases of infection, the material proved to be resistant without clinical signs of persistent bacterial contamination. Mesh-related complications did not occur during the follow-up.